and these procedures should have priority before considering the selective treatment of superficial varicose veins alone. In the absence of deep venous insufficiency, sclerotherapy remains the treatment of choice for superficial spider veins and small reticular veins. In recent years,. Laser therapy has emerged as a viable and effective treatment option, especially in patients with needle phobias. In addition, the 1,064 nm Nd:YAG can also expand our ability to “erase” spider veins as a complementary tool following sclerotherapy. The most common leg vein anomalies include spider veins, reticular veins, and varicose veins arising within the system of the greater and smaller saphenous veins. An appropriate work-up should be performed before considering treatment options. If deep venous disease is present, this should ideally be treated first, as this often causes regression of the superficial veins. 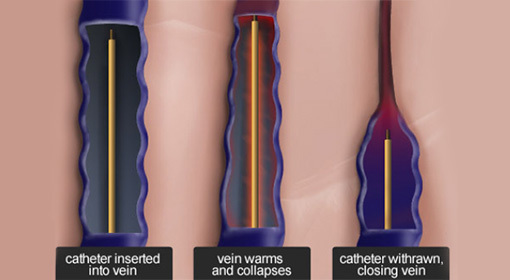 In the presence of venous reflux disease endovenous radiofrequency ablation may also clear a significant portion of the more superficial and reticular veins, and these procedures should have priority before considering the selective treatment of superficial varicose veins alone. In the absence of deep venous insufficiency, sclerotherapy remains the treatment of choice for superficial spider veins and small reticular veins. In recent years,. Laser therapy has emerged as a viable and effective treatment option, especially in patients with needle phobias. In addition, the 1,064 nm Nd:YAG can also expand our ability to “erase” spider veins as a complementary tool following sclerotherapy. One of the common minimally invasive options to treat varicose or spider veins is sclerotherapy. 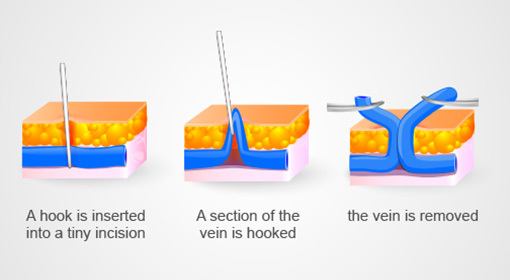 Sclerotherapy is a treatment in which a chemical solution is injected into diseased or problem veins. Laser therapy is used to heat the blood vessel to shrink it. Laser therapy is effective for the treatment of very small varicose veins and spider veins. Laser therapy may be used as an additional treatment after sclerotherapy, endovenous procedures, or surgery of larger veins.